When I was editor of The Stokes News, press days often meant 18-hour work days and going to bed just barely before the birds started chirping. For the last few hours of the press night, I was usually all by myself in that tiny office in Walnut Cove. When I’d feel myself getting discouraged by the work load, I’d play gospel CDs to encourage myself. On many a rough press night or tough day of life, I have told myself to “keep on keepin’ on.” Haven’t you? And have you ever had someone who encouraged you with words that made you want to hang on and keep a-pluggin’? 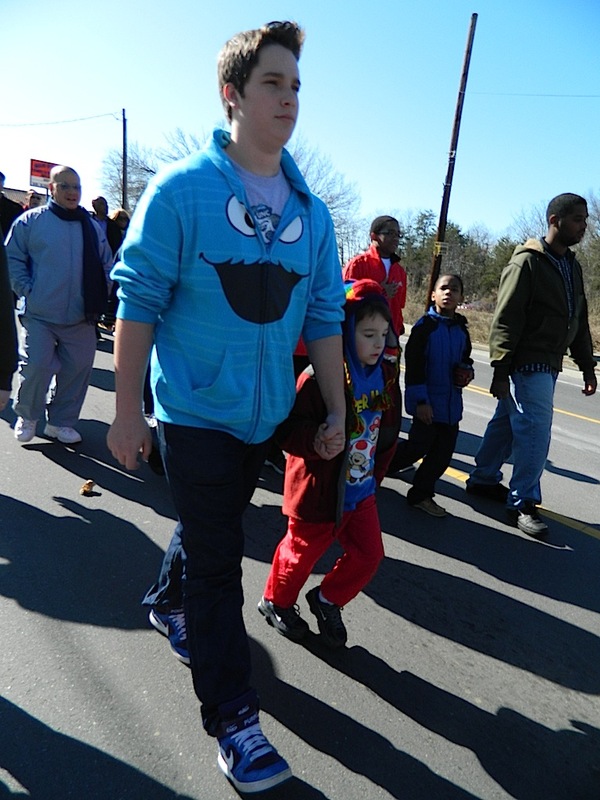 My sons Elijah and Malachi walking today in the MLK March in Walnut Cove. A moment in my life that I will never forget and which illustrates the “keep on keepin’ on” idea happened last year at one of my favorite events–the annual Dr. Martin Luther King Jr. March in my hometown. I took my children to that, as I normally do, forgetting what a long trek it would be for my youngest son’s short legs. Sure enough, by the time we got to the middle of downtown Walnut Cove, seven-year-old Malachi was complaining that he couldn’t go any farther. Meanwhile, I dragged him on, determined not to stop. The leaders of the March were singing, “We Shall Overcome,” but Malachi wasn’t so sure that he could. Soon, his complaints were such that I began to contemplate dropping to the back of the throng of marchers to hitch a ride on the bus that made up the caboose of our March train. People were passing us by as we stopped on the side of the road to rest a spell. Seeing them leave us in the dust made me feel a bit discouraged. And Malachi was as forlorn as could be. But as we started off again, something happened that made all of the difference for my little mister. A local man that I had known since childhood, Reverend Alfred Warren, saw my struggling son and slowed down to speak to him. He smiled a kind smile and leaned over to be more on the level with my little bitty boy. I could visibly witness Malachi perk up. Rev. Warren began to move on ahead again but then suddenly came back to give Malachi a piece of gum that he said would help him make it. My formerly exhausted son suddenly found a treasure trove of energy. He struck an Incredible Hulk-type of pose to get charged up and took off running. Rev. Warren is in the blue jean jacket, smiling at my little Malachi who has begun running UPHILL! 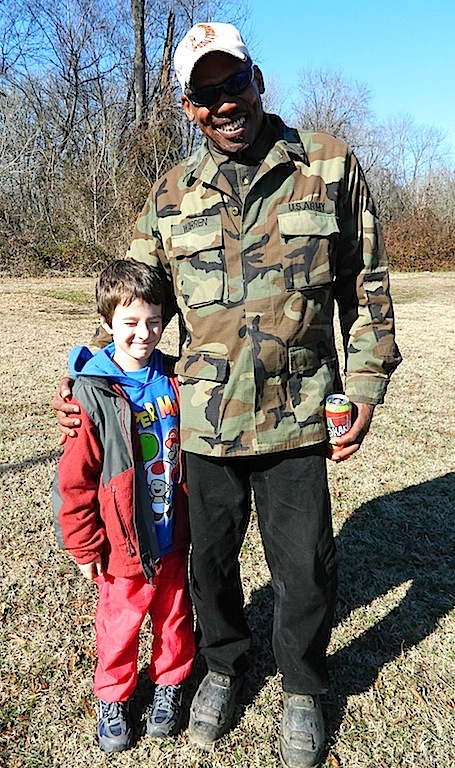 Malachi then ran the majority of the way to Rising Star Baptist Church, with me struggling to keep up. All it took was some kind and loving encouragement. I snapped a picture as Malachi, in his newfound energy, jogged past Rev. Warren. In the photo, you can see them both grinning from ear to ear at each other on the homestretch. That’s the world I want my children to live in. That’s the world Dr. King dreamed of. Welcome to Dr. King’s dream world! 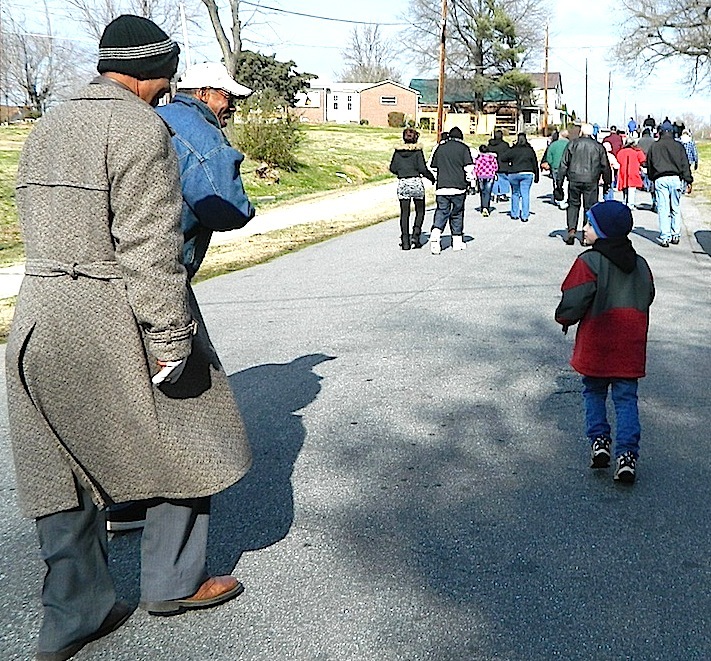 We went back to the annual MLK March today with Malachi a year older and his legs made stronger by his love for running laps around our house. And there was his old friend, Rev. Warren, smiling down on him. They posed for a picture before the March began. And as they parted ways, Rev. Warren bent down to give Malachi a piece of gum to encourage him on the long walk. A grown black man and a little white boy — two people separated by age and race — but bound together by the love and compassion for fellow human beings that transcends our petty differences. Dr. King would’ve been proud. And in that same spirit of cooperation, compassion and love, let’s keep on keepin’ on, shall we? Click below to hear a shortened version of Dr. King’s “I Have a Dream” speech. It will inspire you! Below that is a two-minute version of his “I’ve Been to the Mountaintop” speech that he gave shortly before he was shot and killed. It will raise up the hair on your arms!